There are a few reasons to get your doors right. They’ll be one of the first things people notice. They’re the first thing to think about when it comes to home security. Unlike other parts of your exterior, people interact with them regularly. And on top of that, they’ve still got to keep your warm and comfortable. Though they’re small, your door has to perform in ways which the rest of your exterior does not. The conflicting needs of access and security make the lowly door a deceptively complex part of the home’s envelope. Here are a few examples of doors that can be done to meet the demands of the modern exterior. For most homes, a classic hinged door is the best option. 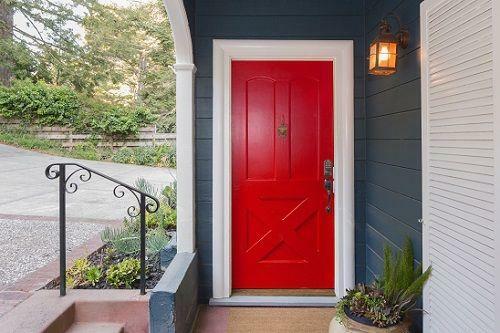 Simple, interchangeable and endlessly customizable, this kind of front door is always an the perfect opportunity for an accent of character on your exterior. Choose from solid wood, composite, or fiberglass. Windowed, paneled, or peephole options available. Painting available for any door. 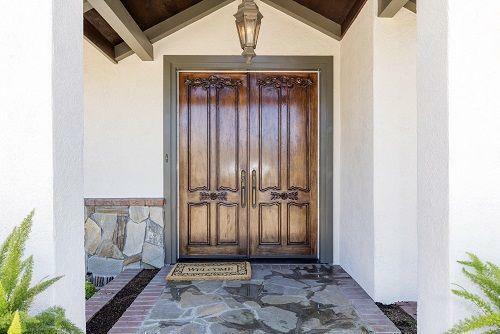 Typically found in homes with room to spare in the exterior, double-doors create a stately frontside to every home. Like our hinged doors, choose from solid wood, compsite, fiberglass and more. The full range oflassic to modern options available. Customize any door with a premium paint job. 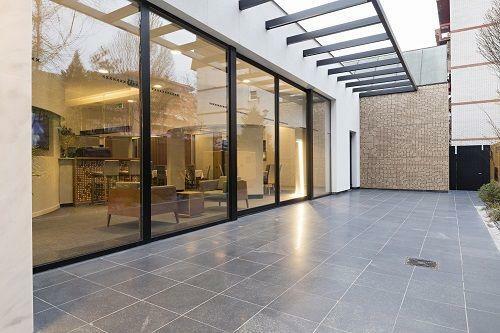 Ideal for an everyday entrance to the backyard or a statement for the front of the home, sliding doors are another must for any home on the ground floor. Most commonly used for simple backyard access. Choose from double and triple pane models for insulation. Commanding solid wood sliders work for updated, modern homes. Aside from providing consistent access in and out of your home, half of your door’s job is to provide security. Security can mean shelter from the cold and rain, but more often it means security from intruders or burglars. While we hope that nobody’s door is ever put to the test, it’s good to know be aware of what makes for a solid, safe door. These are the main elements of a safe door. The more complicated something is, the more likely it is that part of it breaks. And the same rule goes for doors. Sidelites and windows will always make a door less secure than it would be without them. Fortunately, door engineering and design has come a long way, and even decorative doors can be made incredibly secure. Doors made of an aesthetic, veneered particle board are typically bad choices for exterior-facing doors. While they may be fine for inside the home, as a main point of home security, the fall short by every measure. We would recommend that homes looking for an affordable option go for a durable composite instead. When we think “home security,” an image of a lock is usually the first thing to come to mind. Anybody with a realistic need for home security won’t easily compromise when it comes to the door lock. Our suggestion? Employ one deadbolt and one grade 1 door lock for dependable protection without impeding on aesthetic.